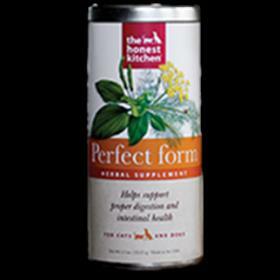 A supplement to support the normal healthy functioning of your pet's digestive tract, The Honest Kitchen Perfect Form nutrition supplement combats gas, facilitates regularity, firms up loose stools, soothes and protects the GI Tract. We reccommend using this supplement in conjunction with a grain-free diet for best results. This stuff really works wonders for the loose stool or slimy poo. It works so much better and faster than canned pumpkin, and I wish I'd discovered it years ago!